Just under two decades ago, I worked with a very talented artist, Mark Ferrari, to create a set of 12 beautiful "Living Worlds" for the calendar program Seize the Day; one for each month of the year. All we had back then was 8-bit color, which meant you could only have 256 colors on the screen at any one time. Computers weren't powerful enough to do full-screen video, but you could make things appear to move by cleverly playing with the color palette. 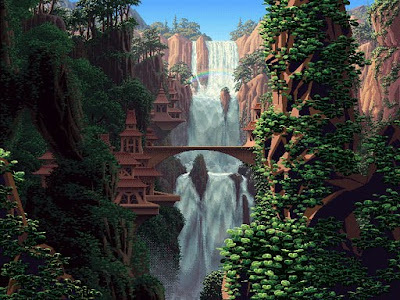 Mark was a master of this technique, painting lush scenes that came to life without moving any pixels, just by shifting the colors around. He took it even further, creating a series of palettes with different lighting, so that the same image could smoothly shift from night to morning to afternoon to sunset, all without changing the pixels, just the colors. Very clever stuff, to be sure, but the results were beyond clever, they were gorgeous, and they drew you in. Somehow you really believed this world was alive, there in your computer. The program wasn't a huge hit at the time, but it made a big impact on those who used it, an emotional resonance that echoes to this day; even now, 20 years later, I regularly get e-mails from poor souls looking for some version of Seize the Day that'll work on their modern hardware. I've been toying with resurrecting it somehow, but I keep getting distracted with other things. I must say I'm delighted, not only by this slick resurrection, but also by the response it's gotten... news of the demo spread like wildfire across the net, with hundreds of thousands of visits, countless blog posts and comment threads, all chattering about the artwork and the technology. Perhaps there is a place for these old things in our new world. I can not believe this. As Ian was writing this post (august 10th) I was waiting for the arrival of my Droid X, where I would happily find a moving, living wallpaper (the grass) that is completely reminiscent of what Ian and Mark did with "Seize The Day." It was a arrow through the brain. I still have the three original STD floppies tucked away in the original packaging and shipping envelope...from 1994. Back in the day when I first got a PC I was looking for a good calendar and downloaded the STD demo from CNET. Anyway, I was wondering if "Seize The Day was still out there so I "Googled" and found Ian. Good to see you guys still at it. Hope to see STD completely updated. Would be phenomenal to have this running on my Droid X, Macbook, or Windows.